Taking a visit to your child’s pediatric dentist due to a sore tooth usually means that you are aware of a possible cavity or other problem that is going on with your child’s tooth. Sometimes tooth issues are easily seen with the naked eye and easy to detect exactly what is wrong. When visiting the dentist for a regular checkup, you may not be aware there are any serious problems going on with your child’s teeth, but the dentist has the ability to see the beginning of a potential problem by utilizing dental x-rays. 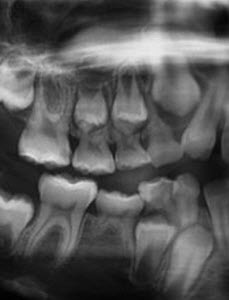 Dental x-rays allow your dentist to detect any dental problems before they turn into serious concerns. A crack in a tooth or puffy gums can easily be detected without an x-ray. However, dental x-rays can detect any trace of oral health problems at their earliest stage. Cavities, gum disease, oral infections and some types of early tumors can all be successfully detected through the use of dental x-rays. Dental x-rays provide the dentist with early detection of potential oral problems and now your dentist can give your child the proper treatment they need before those problems have a chance to develop into something more major. A common concern that patients often have when discussing dental x-rays with their dentist is the amount of radiation they are exposed to during the process of the x-rays. There is no need for concern when considering dental x-rays. Modern technology has reduced radiation levels to minuscule amounts. In addition to the extremely low amount of radiation, dentists take extra precautions like safety aprons and collars to protect the patient from any possible radiation. Most dentists today use digital x-rays, which are much faster and expose the patient to a much smaller and shorter amount of radiation. Dental x-rays are a great benefit to the dentist and to the patient. Early detection of any oral problem gives the dentist a head start on any problems and protects the patient from experiencing a more serious oral health problem in the future. Dental x-rays allow the dentist to see if there is any decay on the inside of the tooth, even though the outside may look like everything is perfect. Early cavity detection can be the difference between a simple filling and a major root canal. If you have not yet had your child’s teeth x-rayed by your dentist, it is a good idea to get it done. Give your dentist every advantage in assisting you with excellent oral care. Contact Smile Reef today! Visiting the dentist is not usually an exciting outing for a child, and if it is their first visit, then it is usually accompanied by a large amount of nervousness. The thought of a dentist can be scary; due to the fact that going to the dentist is almost always discussed in the same sentence as the words shot and drill. However, this is rarely the case, especially when it comes to a child’s first visit to the dentist. It is recommended that your child visit the dentist by the time they turn one, or within six months after their first tooth has grown in. A child’s first visit is usually pretty short and involves little to no treatment. The first visit to the dentist for your child is a great opportunity for them to meet the dentist in a friendly way and begin to feel comfortable at the dentist office. There are some dentists that allow parents to sit in the dental examining chair with their child, this will help the child feel more comfortable and not as scared in the beginning. Other dentists will ask that the parent wait in the reception area so the child and dentist can begin to build a positive relationship. Having the dentist become a friend to your child is a great way to establish healthy dental habits, as your child will not be afraid and even look forward to going to the dentist. It is common for your dentist to check all of your child’s existing teeth during their first visit. They will search for any sign of decay, examine the bite of your child and look for any potential problems with your child’s jaw, gums and other oral issues. The first visit may also include a thorough cleaning of your child’s teeth. This is a great time for the dentist to educate the parent on proper oral health care for children and teach them the proper way to care for their children’s teeth. Your first visit will also include a medical form that you will fill out for your dentist. This will include medical information regarding your child so the office can have that important information on hand. 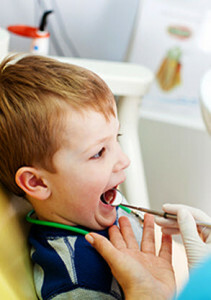 Visiting the dentist for the first time does not have to be a scary experience for your child. Be excited for them when you are discussing their first visit and give them confidence by showing them that you are proud of them for going to the dentist. Smile Reef treats every patient with care and kindness, making each visit, especially the first, a positive experience that will leave your child feeling comfortable and confident when they return. 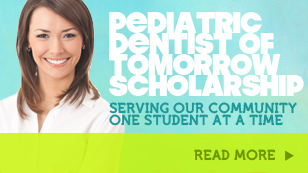 Contact Smile Reef today and schedule your child’s first visit to the dentist.